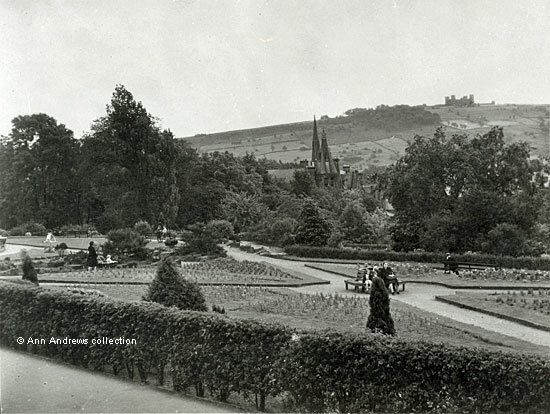 In the run up to Queen Victoria's Diamond Jubilee in 1896 Matlock Council decided they would try to purchase the land where these Public Gardens are today. It was then known as Allcocks and was described as rough ground. The Council's decision was taken because the grand Victoria Hall, replaced by the houses of Victoria Hall Gardens today, had just been opened on the opposite side of the road and its gardens landscaped. They did not want to spoil the view. As the photograph shows, this included the Riber hillside and the towers of Lilybank Hydro. However, in late November 1900 the Council considered selling Alcock[s] on Smedley Street because, although it was considered to be a public open space, an adjoining owner had erected a high wall that partially blocked the view. Councillor Hartley stated that the place could be a "spot of beauty, a retreat and recreation ground, and they would be doing quite wrong in not retaining it". Putting in a rockery and creating a tip, presumably for landfill, were considered but Councillor Arms felt that creating a public tip would be a nuisance and he had been told that large trees were to be planted on the lower grounds. Councillor Fox did not approve of the Council retaining its public open spaces. The Chairman of the Council remained neutral following the vote, a draw, and the none of the suggestions were taken up. It is difficult to be certain quite when the public gardens, bounded by Smedley Street East and Henry Avenue, were developed. Henry Avenue was not shown on the 1899 OS map and the earliest properties were built about 1903. Pre 1914 images of Matlock Bank do not seem to show any park-like development on the site. Sparrow Park does not appear on maps until 1919, when it was not shown as either a park or gardens and covered a much smaller area with had both a Fn (fountain) and Urinal within its boundaries. Post war maps show the gardens the size it is today. Nobody seems to know why it is known today as Sparrow Park. Photograph in the collection of and provided by and © Ann Andrews. A very small part of Victoria Hall's Gardens has survived. Victoria Hall was not demolished until about 1992 but had ceased to be used as a leisure complex before the first world war and later became part of Derwent Mills (Paton and Baldwin). Celebrating Queen Victoria's Diamond Jubilee, 1897 - 26 May. "Derbyshire Times", 10 November 1900. The Arguments About Open Spaces.